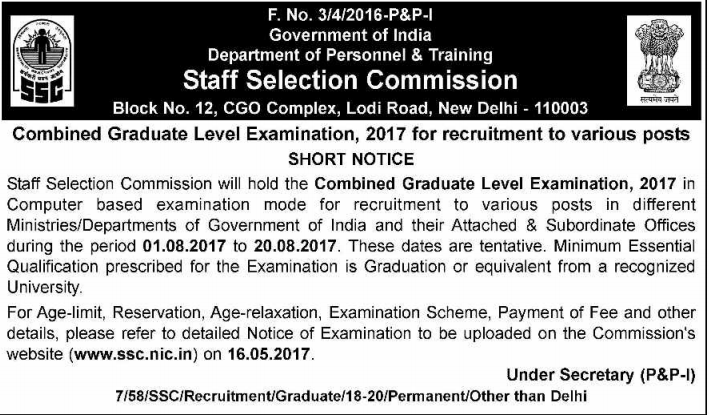 Government of India, Department of Personnel & Training, Staff Selection Commission (SSC), New Delhi will hold the Combined Graduate Level Examination, 2017 in Computer based examination mode for recruitment to various posts in different Ministries/ Departments of Government of India and their Attached & Subordinate Offices during the period 1st August 2017 to 20th August 2017. SSC CGL Exam 2017 short notification was published in Employment News Paper dated 13th - 19th May 2017 Issue. For Detailed notification about Name of the Post, Age limit, Reservation, Age-relaxation, Examination Scheme, Payment of Fee and other details will be availed from 16th May 2017. The detailed notified of SSC CGL 2017 examination to be uploaded on SSC Commission's Website on 16/05/2017.